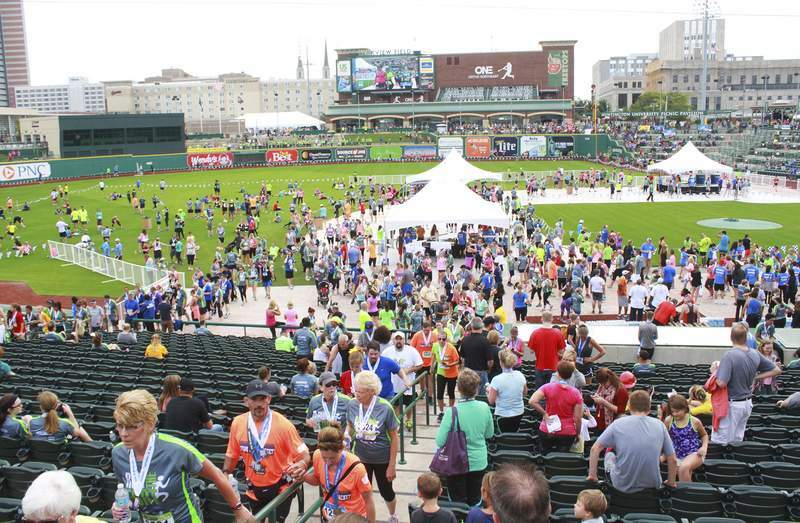 Rachel Von | The Journal Gazette Parkview Field was packed with runners and supporters during Saturday’s Fort4Fitness. • Runner after runner rounding through Parkview Field, the first-timers’ arms raised high as they crossed the finish line at home plate. There could have been a thought bubble hovering over their heads: "I did it!" • A man named Robb Gerken, of Antwerp, Ohio, lugging 45 pounds of gear and dressed in a full firefighter’s outfit, huffing and puffing to the line. He told The Journal Gazette’s Rosa Salter Rodriguez he was training for a children’s hospital fundraiser. • A man named Neal Niezer, of Fort Wayne, struggling with the final yards before finally rolling across the finish line to win the wheelchair division of the half marathon. He told Rodriguez the hills on the course left him completely exhausted. Just behind Niezer was another wheelchair racer, Lazero Rodriguez of Silver Lake, who said he had had an easier time with the hills and bettered his time by 10 minutes. Imagine doing 13.1 miles – hills or not – with only your arms. • A runner pushing a baby carriage. Later in life, does the baby get to say that he or she finished a race before he or she could even walk? Organizing a large-scale, smooth-running event such as this one takes incredible effort. Fort4Fitness’ sponsors, organizers and volunteers deserve everyone’s thanks. Nothing says community more clearly than events such as this one.